Will the “Wormwood Star” go out? Ukraine’s nuclear power engineering began with the Chornobyl Nuclear Power Plant (ChNPP). But the facility turned from a pacesetter into a huge and never-ending headache overnight. On the eve of the ChNPP accident’s anniversary, The Day’s correspondents visited the exclusion zone to find out if there is a chance to restore the environmental status quo of this area. The ChNPP zone administration was established back in 1991 as a branch of the Ministry for Emergencies and Protection of the Population against Chornobyl Disaster Effects. Following numerous transformations, it acquired the current name – State Agency of Ukraine for Exclusion Zone Management (SAUEZM) – and became subordinated to the Ministry of Ecology. SAUEZM chairman Vitalii PETRUK says: “The main goal of SAUEZM is safety and protection of people and the environment from the accident’s effects and potential dangers represented by radioactive wastes and spent nuclear fuel.” In his words, cutting-edge technologies were applied to build the new infrastructure in the exclusion zone. Various countries offer financial and technological aid to run these projects. Besides, the Verkhovna Rada reestablished the radioactive wastes fund last year, which will accumulate target-oriented money from state budget revenues. 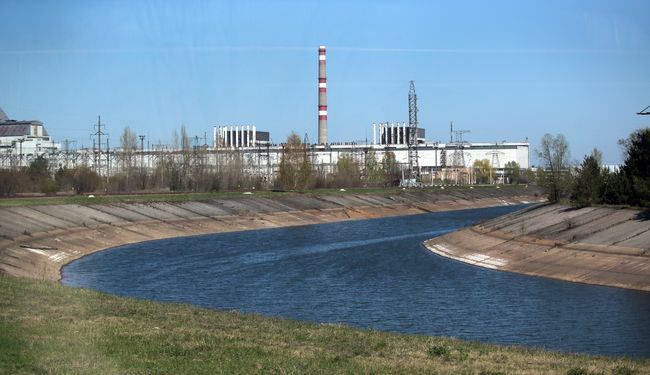 Parliament recently passed in the first reading a draft law with a new classification of radioactive wastes and European standards of their burial. The Cabinet has also submitted a bill that calls for establishing a special industrial zone around the nuclear power plant. These standard-setting instruments complement the updated program of decommissioning ChNPP and turning the Shelter facility into a contamination-free system. “There is a hope that the governmental program will be approved this year, and we will have a stable institutional milieu, funding, and a plan of actions,” Petruk says. Valerii SEIDA, first deputy general manager of the Chornobyl Power Station, told us about plans for 2018. In his words, the new safe confinement – the key element of environmental safety – will be commissioned at the end of this year. The protective arch covered the “sarcophagus” as far back as November 2016. Old unstable structures and the reactors’ equipment will be gradually dismantled under the installation, which could hide Coliseum and the Statue of Liberty, after it is commissioned. Approximately at the same time, “hot” tests of the new spent nuclear fuel storage facility (SVIAP-2) will begin. The contents of SVIAP-1, whose service life is expiring, will be moved there. So far, the new storage facility is undergoing “cold” tests – equipment mounting and systems adjustment are coming to an end. About a third of the exclusion zone will be reserved for special use. On the other territory, there will be the Chornobyl Radiation-Ecological Biospheric Reserve subordinated to SAUEZM. This division is caused by contradictions between the legislative provisions for nature preserves and those for the exclusion zone. The former rules out human intervention into the reserve’s natural process, whereas the law calls for a number of safety measures, such as fire-prevention woodcutting, reinforcement of dikes, construction of protective installations, etc. This is why, unlike Belarus, Ukraine failed to set up a nature reserve object soon after the accident. The president of Ukraine decreed to establish this reserve two years ago, but the relevant governmental office was registered as late as March last year, and funding began in July. Taras MELNYCHUK, acting manager of the reserve, said that the main sections – for research, information, and education, – as well as nature protection patrols, had already begun to be formed. In the future, the reserve’s staff will consist of as many as 600 people. It will have three offices – the main one in Ivankiv, a representation in Kyiv, and a base for shift workers and patrolmen in Chornobyl. The next task is to draw up, with the help of foreign investors and specialists, a plan of territory organization and a project of land management.